This is a Herefordshire variation of the name Hermer itself deriving from the Old English personal name Heremoer - a compound of the elements "here" meaning "army", plus "moer", "bright" or "famous". The medieval form of the name was Heremer and it is first recorded in its Latinized form in the 1176 Pipe Rolls of Staffordshire "heremerus de la Bolde". The surname adopted from this source first appears in the early half of the 14th Century. One, Ambros Harmor was christened on April 9th, 1587 in St. John's, Hackney (London). 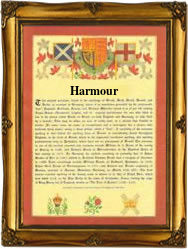 One June 25th 1775 Elizabeth Harmour, daughter of Ann and William Harmour was christened in Sandon (Hertfordshire). In the "modern" idiom the name is spelt Harmer, Harmar, Hermer, Harmour etc.. The first recorded spelling of the family name is shown to be that of Walter Hermer, which was dated 1327, The Subsidy Rolls of Suffolk, during the reign of King Edward 111, "The Father of the Navy", 1327 - 1377. Surnames became necessary when governments introduced personal taxation. In England this was known as Poll Tax. Throughout the centuries, surnames in every country have continued to "develop" often leading to astonishing variants of the original spelling.